The Reverend Samuel Maduma is a Priest of the Anglican Church of Tanzania in the Diocese of Morogoro. 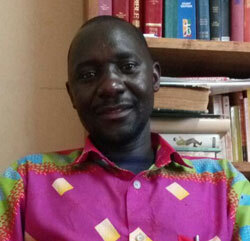 Samuel received his Master’s Degree of Arts in Theology and Contemporary issues from St. John’s University of Tanzania. He holds two Bachelor Degrees. He received his first Bachelor Degree in Christian Ministry from Christian Leadership Seminary and another Bachelor Degree of Arts in Theology with Education from St. John’s University of Tanzania. He also received his Certificate and Diploma in Theology from Munguishi Bible College, Arusha. He also studied a TOW course (Audit) at Bakke Graduate University. Currently Revd Samuel Maduma has enrolled for a Doctoral Program (Doctor of Transformational Leadership) at Bakke Graduate University. Samuel married to Neema since 2007 and has two children, Emmanuel and Victoria. Neema received her Diploma in Childhood Development from Dodoma College of Business Management and currently working for the Children at St. Joseph Parish in Morogoro. Samuel worked in various positions. In 2004 –2006 worked as a tutor at Kiteto Christian College, training Church leaders (Evangelists and Pastors) as well as Priest in charge at St. Peter Parish in the Anglican Diocese of Kiteto. In 2006 – 2009 he was appointed to be a National Coordinator with an international Christian Organization namely Christian Formation ministries Tanzania. The task was to overseer the organization and coordinating the discipleship programs in the country. In 2009 he was appointed to be a Diocesan Secretary General in the Anglican Diocese of Kiteto, performing administrative function. Later on Samuel went for further study at St. John’s University of Tanzania, and after the completion of his Master’s Degree he moved to the Anglican Diocese of Morogoro. Formerly an Academic Dean at Morogoro Bible College, Samuel was appointed as Principal for Morogoro Bible College in August. He is also a Priest in charge at St. Joseph Parish, Msamvu in Morogoro Municipality. After completing his Theology of work course from BGU the end of last year Revd Samuel has become a TOW teacher in Tanzania. He has passion with TOW and he is the leading participant to spread the TOW in Tanzania and beyond. Through TOW grant program of BGU and MSF Samuel has conducted a number of TOW classes include Morogoro and Dar e sSalaam. He looks forward to conduct more TOW classes. Through his experience of teaching TOW he has experienced transformation to himself and the people he ministers. His desire is to see Church and the communities of Tanzania understand the concept of Theology of Work and its impact to spiritual, social and economic development to the people of Tanzania.